Over than 10,000 fans and shoppers descended on Westfield London to see global singer/songwriter and fashion icon, Rita Ora switch-on the 2014 Christmas Lights and perform live on-stage. Rita was introduced on-stage in The Atrium by Television Presenter, Rick Edwards. The official start of Westfield’s Christmas schedule was marked with a dazzling display of confetti, snow and pyrotechnic laser displays. Rita then performed three smash hits Black Widow, her first UK number one and crowd-favourite How We Do, and crowd favourite I Will Never Let You Down, to more than 10,000 adoring fans. Wearing Hoshiko Patchwork Culottes by Whistles Runway with teamed with a matching top and Fendi heels, Rita looked every bit the festive, global superstar. Rita’s debut studio album Ora (2012) went to number one in the UK and produced the number-one singles R.I.P and How We Do (Party). Rita became the artist with the most number one singles on the UK Singles Chart in 2012 with three consecutive singles reaching the top position. In 2014 she also became the second British female solo artist to ever score four UK number ones. But Rita’s accolades don’t stop in the studio; with the singer seen walking in the Moschino AW14 show, closing the DKNY show in February this year, and launching a collaboration with Adidas – Rita has cemented herself as an influencer in both the music and fashion scene. Westfield London and Stratford City have been established as high-profile destinations for celebrity events and performances and have previously played host to A-list names for Christmas lights switch-on events since opening in 2008, including Mariah Carey (2009), Rihanna (2010), Justin Bieber (2011), and Taylor Swift and Rihanna (2012). Although Rita Ora has only been in the public spotlight for a few years she’s already established herself as a fashion icon and credible recording artist. The following are some of the styles Rita’s rocked over the part few months. Rita attended a recording studio in Hackney (March). Rita doing Promotions at BBC Radio One. Rita arriving at Online TV interview with SBETV in August. Rita Continued her promotions throughout the summer 2014. Here Rita arrived at the BBC studios. 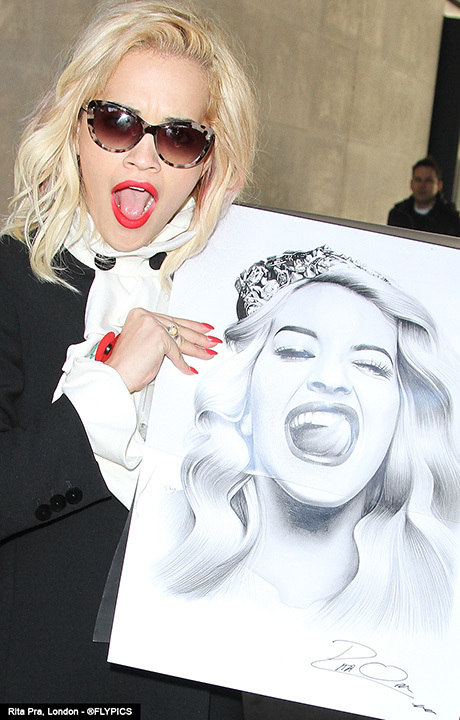 Rita Promoting single FT Iggy Azalea in London (September). Rita Promoting arrives at Chiltern Firehouse (October). Rita Ora celebrates Halloween at Cafe KaiZen, London (October 2014). Rita is a master at self-promotion and has won over many fans along the way. Rita’s road to global stardom started way before she became the household name. Here Rita is pictured by FLYER Newspaper outside Mahiki Nightclub in 2011 (above).